1. Charles N’Zogbia has finally signed for Aston Villa! Yeah, I know he put pen to paper last season, but Villa fans could be forgiven for thinking there was a clause in his contract that meant he couldn’t put in a performance until the Baggies away game 2013. His first half performance – which included two assists – certainly is perfectly timed for the Bradford City semi-final. His running at players at pace should cause mayhem and create chances against the Bantams. 2. The overall first half performance against the Baggies was electric (then Villa fizzled out in the second half). As well as N’Zogbia sparking into life, Gabby put in one of his most effective shifts for a while, including his first league goal in an entity. Then there was another decent performance from the much-maligned Fabian Delph. He’s tackling and distribution have improved no end. The bottom-line is Villa are creating chances and this is good news. 3. Ron’s return. Let’s be honest Vlaar hasn’t earnt his ‘Concrete’ nickname at Villa yet. We should put that on ice until we see some clean sheets. 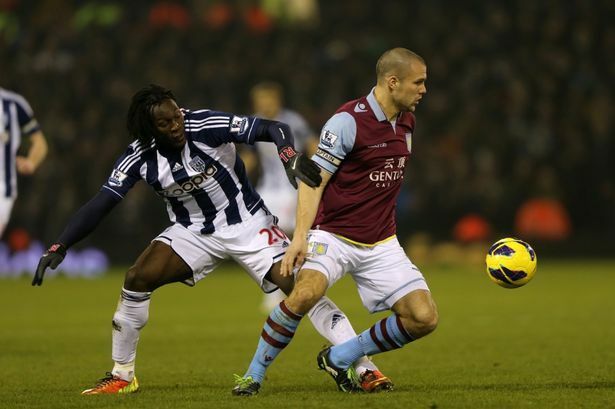 However, having more of a brutish presence at the back is just what Villa need in the final months of the season. In that respect, the return of the Dunney Monster will help too. Young kids with slick hairstyles at centre back just don’t cut the mustard in the short-term. For a relegation battle, Villa need to get more ugly. 4. After over two years of misery at Villa Park, we can put our glad rags on and get suited & booted up for a proper night of Villa Park tension and drama in a high-stakes semi-final. A packed house and a pretty much guaranteed drama-filled match. Any normal team would have come back from Valley Parade with a draw at least. That though is not the Villa way. Do we ever do anything the easy way? 5. The Carrow Road 4-1 and Anfield 3-1 proved to be a false dawn, but to get to Wembley in front of a full house at Villa Park would prove the absolute confidence booster this young Villa team needs to kick on. Some Villa fans point to the Blues winning the League Cup and then getting relegated, but that’s a completely different situation for three reasons: 1) They had champagne in their bellies – they were mid-table and weren’t expecting a relegation dogfight. 2) They had Alex McLeish as their manager. 3) They were in shock for actually winning something. PS – Some of you might have had an additional reason to be cheerful if you followed the MOMS Tip at the end of The ‘Villa Appetizer’ for the Baggies game. It came in! If you opened an account with Paddy Power through the MOMS offer (free £20 Bet when you bet £10) we suggested putting a £10 bet on this four-game accumulator [West Ham/QPR draw, West Brom/Villa draw, Man City win, Liverpool win] then with the FREE £20 BET you get, putting that on the following treble: [Villa Win, Spur/United Draw, Swansea Win (home to Stoke)]. All the other results came in, so in the end, it all depended on the Villa game to how much you won; which I was confident Villa would get something from. Well, you would have been seven minutes away from winning over £720 from the free £20 bet, until WBA equalised, BUT with WBA making it 2-2, that meant the original £10 was triggered, so you would have picked up a handsome £202!